When buying online, slight colour disparities can be somewhat confusing. The colour of things can vary in many different ways due to varying conditions. If you are concerned about the colour of the products you want to purchase being a very exact shade, please read this guide first. Take a look up at the ceiling (or sky if you're lucky enough to be sitting outside reading this). Notice how the light right at the source is brightest and as you get further away from the source, the light on objects becomes less and less bright. This is just one factor when it comes to light sources making a difference to the colour of objects as seen by the human eye. The chart to the right is an example of how colours will change depending on light sources. Light is measured in Kelvins. On the left you can see approximate colour temperatures of various sources of (mainly) natural light ie. direct sunlight is around 5300K. 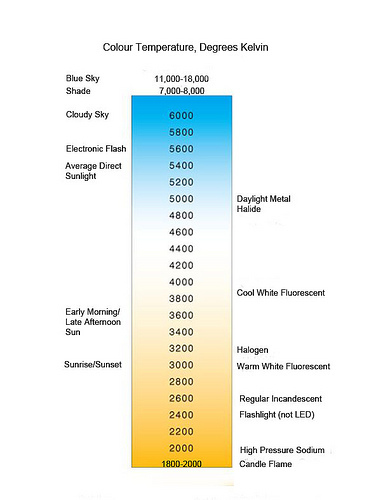 On the right are approximate temperatures of artificial light sources ie. a halogen light bulb is around 3200K. When we look at objects under different light sources, the colour of the item looks different. So when we look at the ties inside at night under a 50W 3200K yellow light bulb, they'll look different in shade to a fluorescent bulb in a bathroom. Or if we look at them at midday on a sunny day, they'll differ from the light at 5pm on a cloudy day. The colour of things viewed can also vary from monitor to monitor. Some will have brighter settings and others will be darker. Some will give colours a slightly more red colour and others slightly more blue. Think of when you go into a department store and look at 20 different TVs all lined up next to each other. The colours on each will differ slightly. We even notice this ourselves with the computers we use to check the pictures on - slight variances from monitor to monitor. Also please note the old CRT monitors (big back like old TV style monitors) are extra liable to give a blue tinge to images. All the pictures of the ties on Aussie Ties are taken in a studio setting where the white balance has been programmed into the camera. This sets the 'base' level of what white is and the camera then applies these settings to produce the most accurate version of each product's colour when photographed. Perhaps if you need a reasonable number of ties and/or accessories and need them to be very accurate in matched colour and you're a little bit hesitant to buy so many in case they don't match exactly, then a smaller initial purchase might be a better option. We have a no hassle return policy which customers are welcome to take up. Here's our swatch card which has all but 5 of the colours on it. If you're a wedding or bridal company for example and would like to use us long term, please feel free to contact for a free swatch card. 1. Blush - fits in with the baby pink, coral, dark coral range. 2. Beige which is a nice fawny brown. 3. Sea mist as our turquoise started becoming a little too blue so now we have a nice green turquoise that also is on the way to jade. 4. Marigold - a classic orangey yellow compared to our more greeny yellow daffodil. 5. Maroon which is between burgundy and eggplant - it really is close to the Queensland rugby league team colours. Thanks very much for reading our colour guide.